One must assume that extraterrestrials capable of traveling across the galaxy to reach Earth are extremely advanced in the technological sense. They probably had no need to appear in person in front of any humans unless, of course, if they wanted us – people of today – to know what they looked like. The people of Tiwanaku encountered an aquatic extraterrestrial inside a water-filled spacesuit, someone who apparently flew down from sky in the style of Superman. Surely such a creature would have been very strange to them and their artists relied heavily on animal symbolism to depict his qualities. On this page we accurately reproduce the drawings of Bolivian archaeologists adding only shading to give us a better reflection of the physical appearance of this creature. A few years ago I saw a directory listing with a description of something like: "I was abducted by aliens last summer. It really happened." Though I had a lot of interest in aliens, I did not even consider visiting that website. Of course, if this person was genuinely abducted by aliens, I would want to read about it but I have learned from experience that there was almost no chance of this being a true story. In some ways it is wonderful that humankind has advanced to the point of ignoring all the nonsense and quackery. On the other hand, if anyone really did have contact with an alien, it would be almost impossible to get any attention. Case in point are drawings from the Andean region of South America and dating back to early medieval times. Here I am not referring to the famous Nazca Lines which could have a non-alien explanation. I am referring to certain drawings of Tiwanaku (Tiahuanaco), a city in the Bolivian highlands. In Tiwanaku, there are no geoglyphs (ground drawings) like in Nazca, but here we find clear depictions of a creature that may be an alien astronaut. It does not take a lot of imagination to envision a four-fingered creature (the face is clearly non-human) wearing an astronaut&apos;s helmet with a transparent visor. One engraving has twenty fish-head symbols overwhelmingly indicating that this creature was an aquatic. Indeed, it is easy to imagine that the astronaut&apos;s helmet was filled with water, from where archaeologists, mistaking the air bubbles for tears, refer to him as the "crying god." In general, Tiwanaku drawings (and the aquatic infrastructure of Tiwanaku) strongly suggest that their god was a fish. Enter the cynics: "They ate fish and made a drawing of the local fisherman." Archaeologists have determined that Tiwanaku was an agricultural community but, true, Lake Titicaca is only some twenty kilometers away. Fortunately, not all the depictions of the alleged alien display fish head symbols. In some, the fish heads are gone and replaced with condor heads (symbolic of flight). Hence, this creature was not only a fish, it was a flying fish; and seeing the bird depictions, some archaeologists have concluded that this was a sky god. No doubt, the cynics will now counter, with total disdain for the intelligence of the Andean peoples: "They ate birds too, and this is the local bird hunter." Many archaeologists believe that the figure depicted on the Gateway of the Sun (the preceding drawing) was Viracocha, the creator god. As we shall see later, this is not Viracocha but amaru, the Serpent, also known as el pajaro Indi (Inti), the sun bird. The city of Tiwanaku is much older than the Nazca Lines but archaeologists have noted stages of development. The timing of Tiwanaku&apos;s expansionist phase does indeed correspond with the timing of the Nazca Lines (again, see below for details), and the Nazca depiction is close enough to the Tiwanaku depiction that we can conclude that these gods are one and the same. This has always been the major hurdle for alien theories about the Nazca Lines: lots of ground drawings to be viewed from the sky but no depiction of the aliens. But here on the Nazca vase we find the alleged alien, and he was the astronaut of Tiwanaku. There is, however, one important difference between the Tiwanaku drawings and the Nazca drawing. In the Nazca drawing, the alien is depicted with human-like feet, though the fish heads just above the feet and looking down suggest that these are not really human feet but fish feet. Nonetheless, no Tiwanaku depiction of their god shows him with feet that even remotely resemble human feet (feet are seen only in depictions of anthropomorphic symbolization of the alien&apos;s qualities, never on the alien himself) and in fact their direct drawings of the alien display no feet at all. That makes sense. The alien didn&apos;t have feet but rather an aquatic tail that dragged behind it and hence was not visible from a frontal view. Thus, the artist of Nazca made the pottery drawing from one of Tiwanaku&apos;s frontal image depictions that came into his possession, and then merely improvised the feet. The drawing of the Tiwanaku alien on a Nazca vase cannot alone lead us to conclude that Tiwanaku made the Nazca Lines (a major theme of this website) but it does indicate that Tiwanaku artwork was present in Nazca. So what did the alien&apos;s feet really look like? That&apos;s easy to answer. While the artist of Nazca may have never seen the alien up close, the artists of Tiwanaku sure did and they provide us with plenty of drawings. This alien had an aquatic tail that split into three appendages, and each appendage ended in a pod with three toe-like protrusions. In one drawing, the alien&apos;s arms are raised up as it is about to launch itself into the air. Apparently, the displayed hand-held devices are providing the power, possibly an anti-gravitational field around the alien astronaut as his tail (lighter than the body) is rising first. The left and right pods are displayed upward and outwards while the middle pod of the alien&apos;s tail is depicted up above his head. The Nazca drawing likewise displays the middle pod up above the helmet, but evidently the Nazca artist did not know what it is, which leads us to believe that the Nazca drawing was based on a Tiwanaku image and not on direct contact with the alien. The self-propulsion concept could explain why we don&apos;t find drawings of any type of landing craft. To all appearances, the alien astronaut didn&apos;t use landing craft. He simply put on its water-filled space suit, grabbed hold of its powerful instruments, and then spiraled down to Earth (the Andean people made so many drawings of spirals that we have to conclude that the alien descended from the sky in a spiral motion, like water funneling down a drain). Meanwhile, the puma heads seem to suggest that the alien did not rise up into the sky in complete silence, that is, creation of the anti-gravitational field may have made an audible "roaring" sound. 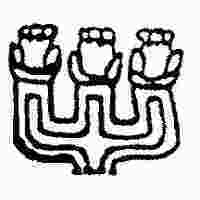 The artists of Tiwanaku also made drawings displaying the alien&apos;s tri-pod tail intact. These drawings of the aquatic tail are significant as they clearly establish that the god of Tiwanaku was not human. As far as I have been able to determine, this aquatic tail does not resemble any plant or animal life form known to exist on planet Earth, past or present. Later on, you will find an article on the theme of alien evolution. 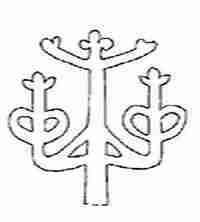 The tail drawings do resemble, however, the Candelabra geoglyph found on a cliff facing the sea in Paracas, Peru. Note that each image reflects three appendages, and each appendage ends in a pod, and from each pod three "toes" protrude. For a long time the Candelabra geoglyph has mystified archaeologists, but Tiwanaku drawings make it clear that this geoglyph is nothing more than a depiction of the tail of the Tiwanaku alien. Thus, the Tiwanaku empire reached Paracas, which lies to the northwest of Nazca, but Tiwanaku lies to the southeast of Nazca. In other words, the Tiwanaku empire had to have crossed the Nazca plain. Indeed, in the Nazca region itself, there is a alien astronaut geoglyph (bottom photograph on the target page), with extended arms holding instruments, and with three legs corresponding to the three aquatic appendages. Some of our scientists would have us believe that the ancient peoples of Nazca flew around in hot-air balloons, hence they made those ground drawings to help sell balloon-ride tickets. Don&apos;t believe them! Archaeological evidence from the Andes lends support to the theory of contact with an alien. There are dozens of surviving images from the Tiwanaku civilization that could be depicting an alien astronaut. In great detail, these drawings depict a fish-like face and mouth, reptile-like eyes, a plausible astronaut helmet replete with sunlight reflectors around the visor and air bubbles inside the visor, four-fingered hands, a tri-pod tail, a plausible front-mounted voice transmitter, not to mention those hand-held instruments that seem to contract and split open upon liftoff up into the sky. Turning a blind eye to all this evidence, our scientists continue to propose one ludicrous non-alien theory after another. I read about a new one not very long ago. Scientists from National Geographic came up with conclusive proof that the Nazca Lines have nothing to do with aliens: they found that some of the lines point to water sources. I saw just a brief clip so I don&apos;t know how they explained the circular-type drawings (which obviously point to nowhere) or explained how the people of Nazca managed to get airborne in order to follow the lines. Nonetheless, this may be the first scientific theory to make a little sense. It is only logical that the people of Nazca would want the lines to point to water. After all, as we just noted, this flying alien was a fish! Ancient Aliens and others make many unfounded claims regarding the age of the city of Tiwanaku and the Nazca Lines. Of course, if we are going to use archaeological evidence to link the Nazca Lines to the Tiwanaku empire, it is important to provide some evidence of correlation in time. The Nazca Lines themselves cannot be dated via radiocarbon analysis. In the paper Dating the geometric Nasca lines in the Peruvian desert, W.J. Rink & J. Bartoll state: "Wooden posts at the intersections of two different sets of lines have given uncalibrated 14C dates of AD 525 +/- 80 and 490 +/- 80 (Bray 1992)." Allowing time for the trees to grow and perhaps existing for a while prior to being used to stake out the lines, it is safe to assume that the geoglyph project began in the late sixth century or early seventh century. The period AD 600 to AD 700 would be a good guess for this project. This city is extremely old but archaeologists have noted stages of development. The expansionist phase is generally believed to have begun around AD 600. Wikipedia quotes William H. Isbell: "Tiahuanaco underwent a dramatic transformation between AD 600 and 700 that established new monumental standards for civic architecture and greatly increased the resident population." This was the epoch of alien impact.